Brandon Turbeville of BrandonTurbeville.com joins us to discuss his recent article, “Kurdish Federalization Reminiscent Of Kerry’s Plan B, Brzezinski, NATO’s Plan A.” We break down the Kurdish groups that are involved in the plan and the globalist institutions that have shaped it. The Syria Proxy War against the Islamic State (ISIS) Has Reached its Climax. Military Escalation, Towards a US-NATO Sponsored Ground Invasion? Washington’s strategy consists in spearheading a broader regional war by inciting Turkey, Saudi Arabia as well as Israel to do the “dirty work for us”. Until recently, Syrian Government Forces together with their allies (Russia, Iran, Hezbollah) have been confronting so-called “opposition rebels” largely composed of “moderate” terrorists and mercenaries, with US-NATO intelligence and special forces forces operating covertly within their ranks. The Al Qaeda affiliated terrorists and the Islamic State (ISIS) forces are supported by US-NATO-Israel and their Persian Gulf GCC allies. Turkey and Saudi Arabia, in close liaison with Washington have played a central role in the recruitment, training and financing of the terrorists. Sofar, this proxy war has unfolded without a direct confrontation between US-NATO allied forces and Syrian government forces, which are supported militarily by Russia and Iran. A major transition is now occurring in the conduct of the war on Syria. The terrorists are being defeated by Syrian government forces with the support of Russia. The proxy war (under the formal banner of the “war on terrorism”) has reached its climax. Turkish forces are now directly involved in combat operations within Syrian territory. In turn, Saudi Arabia, which is a State sponsor of terrorism has announced that it will be dispatching troops to Syria, allegedly with a view to combating the ISIS terrorists, which just so happen to be supported by Saudi Arabia. Were Turkey’s actions against Russia a provocation, or a response? Analysis indicates a bit of both, but tending towards response. Turkey struggles to maintain its interest in the Syrian conflict, importing oil from ISIS controlled areas. Russia recently dealt a serious blow to ISIS, striking a convoy of oil trucks headed to Turkey. From this perspective, Turkey has retaliated against Russia. What will Russia’s response be? Inside Russia, the 5th and 6th column will use this against the Russian state – the 5th saying this is proof that the Russian activity in Syria produces unwanted consequences. The 6th will say that this is proof that Russia needs to push further. Rather, Russia must not be controlled by its responses, but must forge its own activity. Bilal Erdogan is a financier and owner of the oil trucks used by ISIS. 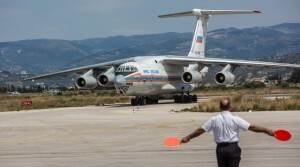 The Russian strikes against the Ergodan family business have both personal and geopolitical ramifications for Turkey. This leads us to conclude that the downing of the Russian jet was not merely the order of a local airforce captain making a bad call – but rather the planned and thought-out action of the entire Turkish establishment. Hersh would also reveal that at the time, the US – then under the administration of President George Bush and through intermediaries including US-ally Saudi Arabia – had already begun channeling funding and support to the Syrian Muslim Brotherhood who would in 2011 play a crucial role in the opening phases of the destructive war now raging across the Levant. Through the US State Department’s National Endowment for Democracy (NED) and US State Department’s Movements.org, agitators were literally flown on several occasions to both New York and Washington D.C. as well as other locations around the globe to receive training, equipment and funding before returning to their home countries and attempting to overthrow their respective governments. What In The World Is Happening In Macedonia? 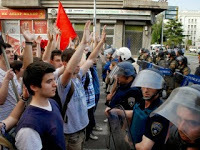 In May 2015, protests began erupting in Skopje, Macedonia against the Prime Minister Nikola Gruevski and his government. The protests, led by Zoran Zaev, were allegedly in response to the massive spying and surveillance of Macedonian officials and other individuals as well as an alleged cover-up of a killing of a young man by police in 2011. The protests were largely focused on the issue of government corruption, with tens of thousands of people in the streets of Skopje, demanding the Prime Minister’s resignation as well as that of other members of his government. A major protest occurred on May 5 and several other anti-government protests have taken place since then. While some protests have remained peaceful, there has been widespread violence from other demonstrations. On the May 5 protest alone, violent clashes took place between protesters and police with injuries taking place on both sides. In the days that followed, several Macedonian ministers resigned from their posts, including the Interior Minister. Prime Minister Gruevski, however, has refused to resign, characterizing such a move as cowardly behavior. On May 17, thousands of protesters once again descended upon the streets of Skopje to demand the ouster of the current government. On May 18, however, thousands more took to the streets to protest in support of the current government and Prime Minister Gruevski. An anti-government, anti-Gruevski camp has been set up outside government offices and remains there indefinitely with several hundred inhabitants on average. With such social unrest taking place in Macedonia, one need only look to the NATO/US and George Soros-funded networks to see the hidden hand of the Western Color Revolution apparatus at work. Macedonia may at first seem an unlikely target of the Anglo-American color revolution apparatus, but the truth is that the small country is now the latest battleground in a proxy war between Russia and the West. Not only are the two sides competing for influence over the domestic affairs and political decisions of the Macedonian government, there is also the question of geopolitical positions and the agenda of the creation of micro-states and mini-states. Most notably, however, is the interest regarding the Balkan Stream pipeline (aka the Turkish Stream Pipeline). Indeed, in the last few weeks, geopolitical alliances and talks have begun to coalesce so as to indicate that such an attack is not only possible but probable in the near future. After all, the US and NATO have attempted to gin up support for a direct assault on Syria since early on in the crisis when it became apparent that proxy armies of terrorists alone were not going to accomplish regime change. The plans – at least from Turkey’s side of the fence – appear to be twofold. First, the plan to attack Syria has been part of the NATO agenda from the moment the death squads were routed by Assad’s forces and Turkey has always been a major playing in this regard. Secondly, Prime Minister Recep Erdoğan’s own governing party has been suffering under a number of scandals, criticisms, and failures over the last several months and, as is the case in every country, a foreign war is more than helpful in diverting the attention of the local population away from domestic concerns. While certainly not the cause, plunging support from the Turkish public is certainly a stick used to prod Erdoğan into further action. Emboldened by their illegal war in Yemen and their ability to massacre civilians abroad with little condemnation, the Saudis are apparently feeling more capable of acting against Syria directly and especially in concert with the Turks and Qataris. These attacks on Syria would undoubtedly take place – much like the Yemeni strikes – with US backing and support. US policy think-tank Brookings Institution confirms that contrary to propaganda, US-Saudi “moderates” and Turkey-Qatar “Islamists” have been coordinating all along. The war in Syria continues to drag on, with a recent and renewed vigor demonstrated behind an opposition long portrayed as fractured and reflecting a myriad of competing foreign interests. Chief among these competing interests, the public has been told, were the US and Saudis on one side, backing so-called “moderate rebels,” and Turkey and Qatar on the other openly backing Al Qaeda and its various franchises including the Islamic State (ISIS). 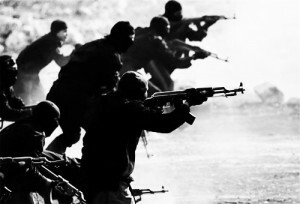 However, for those following the conflict closely, it was clear from the beginning and by the West’s own admissions that success hinged on covertly providing arms, cash, equipment, and both political and military support to Al Qaeda and other sectarian extremists, not opposed by Saudi Arabia, but rather by using Saudi Arabia as the primary medium through which Western material support could be laundered. Overall, Brookings is pleased to report that with the infiltration and overrunning of much of Idlib in northern Syria, it appears their long-stated goal of creating a seat of power for their proxies within Syria’s borders and perhaps even extending NATO aircover over it, may finally be at hand. Brookings still attempts to perpetuate an adversarial narrative between the West and Al Qaeda, despite admitting that it was only with Western backing that recent offensives spearheaded by Al Qaeda itself were successful. In reality, as far back as 2007, it was the admitted policy of the then Bush-led White House to begin arming and funding sectarian extremists, including Al Qaeda, through the use of intermediaries including Saudi Arabia. Veteran journalist and two-time Pulitzer Prize-winner Seymour Hersh in his report “The Redirection: Is the Administration’s new policy benefiting our enemies in the war on terrorism?“would lay bare this conspiracy which has since then unfolded verbatim as described in 2007. 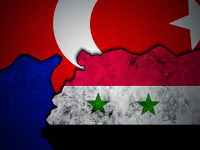 Turkey has now officially proven that Israel and the United States are not the only nations that can brazenly violate the sovereignty of other countries, Syria in particular, without fear of reprisal due to NATO support and a blatant culture of aggression. The Turkish invasion of Syrian soil on February 22 under the guise of protecting and securing the tomb of Sulayman Shah is case in point. The tomb is largely recognized as a Turkish exclave since the early 1920s when, in 1921, it was agreed in the Treaty of Ankara that the Turks would be allowed to raise the Turkish flag over the tomb and place a small number of Turkish guards around the mausoleum given that Sulayman Shah bears such significance to Turkish history. The tomb is located about 23 miles from Turkey itself and thus is located inside Syrian territory. According to mainstream Western press like CNN, the Turks were forced to evacuate the tomb and its contents due to the escalating violence in the area. CNN also reports that the evacuation was led and conducted with the 40 guards stationed around the tomb. However, the reality is that the tomb evacuation was actually a relatively large military operation involving about 600 Turkish soldiers, 100 tanks, and APCs. The Turkish military apparently entered Syria via Kobane (Ayn al-Arab). Yet, while ISIS presence in towns and cities surrounding the tomb was cited as the reason for the evacuation, it should be noted that ISIS, so close to the tomb, never fired one shot at the Turkish military as it conducted its operations. Since, if Western press reports are to be believed, ISIS is the absolute worst strategist when it comes to avoiding unnecessary conflict with nations not necessarily engaged in combat against it, the fact that ISIS forces would allow the Turkish forces to enter its “territory” without so much as even the threat of violence is questionable to say the least. What is much more believable, however, is that the Turkish forces acted in coordination with ISIS forces so as to justify an essential invasion of Syria and establish a foothold there as the Israelis direct ISIS forces and bomb Syrian territory from the Southwest and Jordan facilitates terrorism from the South. Of course, the U.S., NATO, and its proxy forces in the eastern portions of Syria simultaneously push toward the same center of the country at the same time. This is not the first time the tomb of Sulayman Shah has been used to justify Turkish military engagement inside Syrian territory. Syria is winning the war and has absolutely no reason to show mercy for opponents that have no intention to show any for it and its people. February 18, 2015 (Tony Cartalucci – LD) – Curious is the United Nation and NATO’s sudden interest in peace. Both organizations are suing for truces on two separate battlefields, one in Ukraine in Eastern Europe, and another in Syria’s northern city of Aleppo amid a regional conflagration in the Middle East. 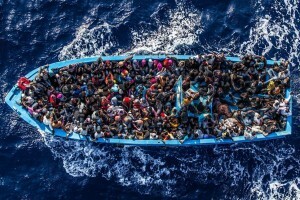 It is curious because talks of “truces” were completely absent just as recently as 2011, when both organizations, the UN and NATO, backed hordes of terrorists sweeping across Libya, committing abhorrent atrocities including the systematic, genocidal extermination of Libya’s black communities. Image: No “ceasefire” or “truce” was proposed by the UN or NATO, because the terrorists they were backing were winning. Such calls are meant not to alleviate human suffering, but to preserve, buy time for, and rebuild forces committed to expanding such suffering. There was also the encirclement, intentional starvation, and denial of humanitarian aid, along with the bombardment of Libyan cities like Sirte, which also saw no protests or calls for “ceasefires” by the UN or NATO. In fact, as terrorists enforced blockades on the ground to starve residents to death, NATO bombed the encircled cities relentlessly from the air for weeks. The eventual fall of Sirte, for example, would leave behind an utterly devastate city and a decimated, scattered population. Other cities, like Tawarga, had their entire populations, down to the last resident, either killed or forced to flee.